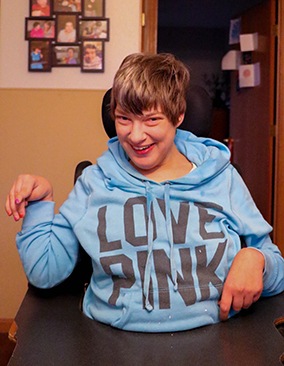 Erin lives in a Supported Living Services home with three other individuals. At home Erin enjoys coloring, watching movies (especially Never Been Kissed), sorting recipe cards, listening to music and going shopping. One of Erin’s greatest talents is helping the cook and she likes making her favorite food—tacos. Erin works at MRCI where she enjoys her job of recycling books and magazines. Her dream job would be anything outside. Erin enjoys talking to her parents on a regular basis and especially enjoys spending time with her dad. She has a brother and a family dog named Molly. Erin says that she would love to travel the world and go camping. Erin feels that her best characteristic is her smile and her eyes. Her smile and sparkling eyes are the window to her personality and can brighten any room.